Bunker is one of the sectors in impressive Scigliera di Salinella Centro. crag one can easly spend few weeks on. 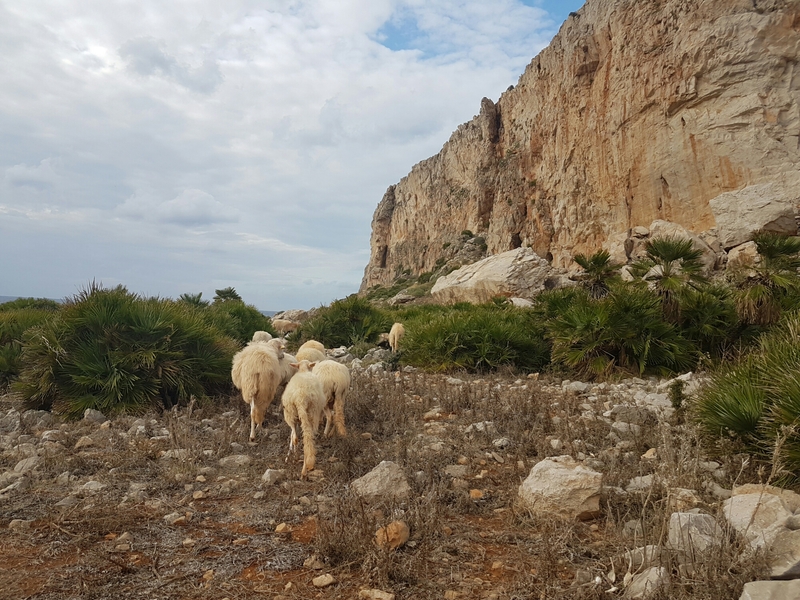 The crag is less than 2km from our place and makes a for a great climbing spot with 168 routes between 3 and 8b (46 of them are in 5a-c grade with further 86 in 6a-c ranges). We left around 10 which is our usual start time and met with Sonja’s friend – Gronja who is vacationing with her family in the area. She got a day off today and was able to join us. 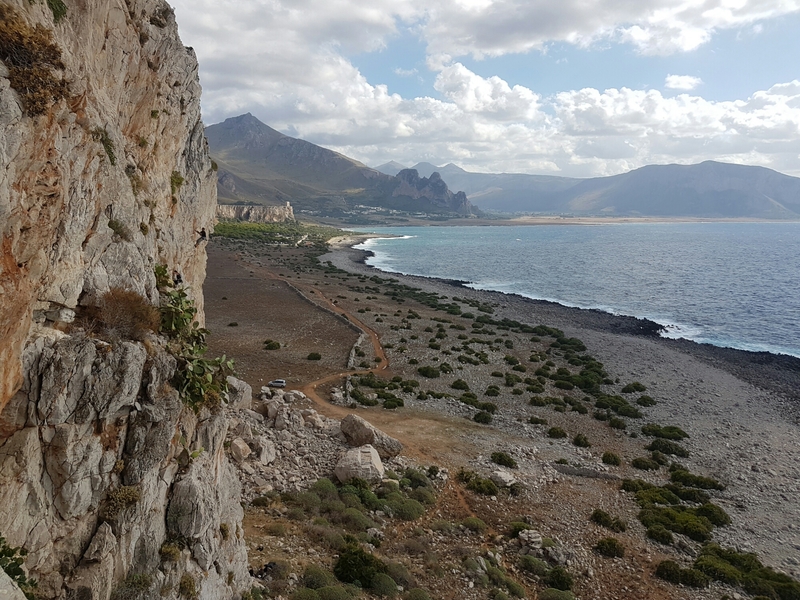 We started with a warm up part of the sector marked C2.2 in the Sicily Rock guide book. I onsighted all 3 easy routes that are next to each other (with Monika and going 2nd).Gronja also did one of them with us. That part of the crag has only 9 climbs and was pretty busy so Monika and I moved right where further 20 routes were awaiting conquering. 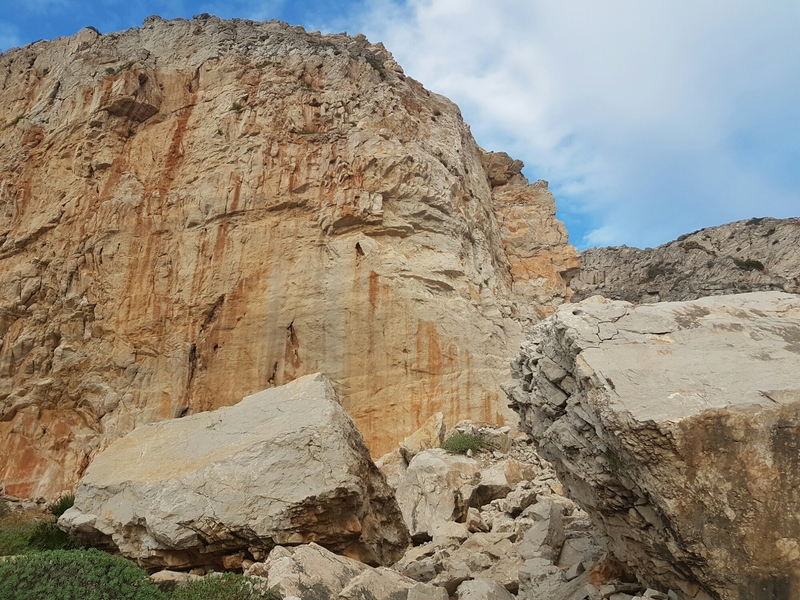 The guys stayed in place to battle the queues to some of the more challanging routes left there (up to 6b+). I’ve focus on more relaxing routes so both of us could enjoy the time (and the sun) on this SW facing wall. One thing I can tell though- no matter what the grade is, 30m pitch is 30m of hard work. I on sighted following 4 routes (all next to each other) with Monika top roping after. All of them had overhanging sections which made climbing very enjoyable. 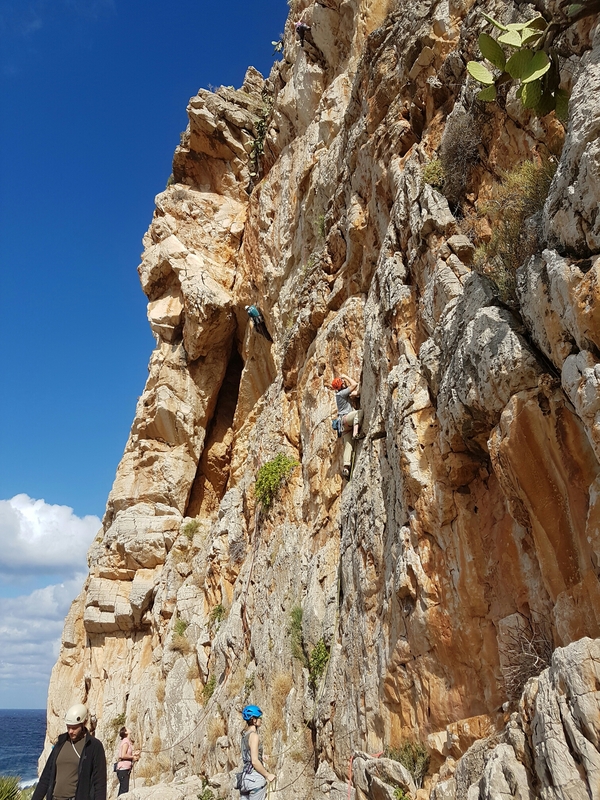 Lavoro di Domenica 5c+/6a 30m – it was the first route put up on that wall. Definetly amazing with the first clip 6m of the ground. Fur Chrstian 5c 28m – much easier than previous one. Per Giorgio il mio amico 6a 22m. As I said this secotr has many moreroutes to doand we just scratched its surface today. At this point I’m convinced we will be comming back to Sicily in the future. There is just so.muvb quality rock.